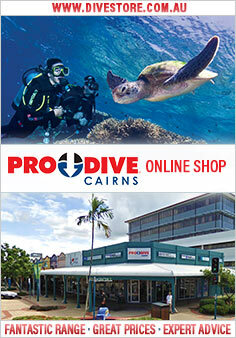 Catering for the certified dive market and snorkellers, Pro Dive Cairns have 3 fully equipped, purpose built multi-million dollar dive vessels � Scuba Pro, ScubaPro II and Scubapro III. This is certainly one of the very best outer reef liveaboard experiences out of Cairns. Come and experience one of Cairns most intimate sailing, diving and snorkelling adventures on the spectacular outer Great Barrier Reef. With a maximum of just 12 passengers and an attentive crew of 3, you can enjoy a more personal reef experience, exclusive to a small group. Coral Sea Dreaming is a 16 metre modern steel ketch. She is spacious and comfortable, with a beautiful wooden interior and different cabin options to please the most discerning traveller. 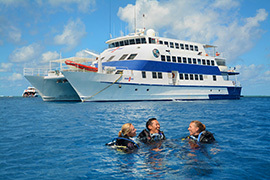 Join Deep Sea for the adventure of a lifetime diving the magnificent Outer Great Barrier Reef. With daily departures available, they can offer the certified diver a flexible diving itinerary. Reef Encounter is a fully air conditioned 35 meter catamaran hotel, designed for the upmost stability and comfort at sea and can carry up to 42 passengers onboard.